An Aussie ant has just set a new record for the fastest animal movement on earth with jaws that snap shut 5,000 times quicker than the blink of an eye. 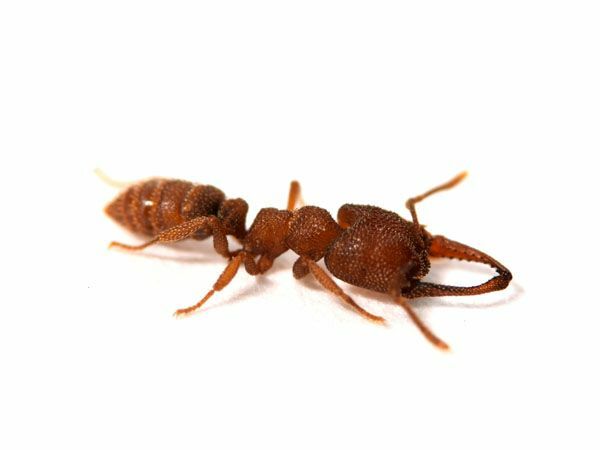 The ant, known as the Dracula ant, uses a snapping mechanism to quickly slide their mandibles across each other similar to a finger snap. Scientists used high speed video to record the jaws going from zero to around 320 km per hour in 0.000015 seconds, making it the fastest known animal movement. Funder: This work was supported by the National Science Foundation (DDIG DEB-1407279 to F.J.L., IOS-1755336 to A.V.S. ), the Smithsonian Institution (Peter Buck Fellowship to F.J.L. ), and the National Geographic Society (Explorer’s Grant 9481-14 to A.V.S.). More than natural history trivia, animal speed can determine whether they catch food or are eaten by a predator. The fastest animal movements incorporate latches and springs into their appendages to overcome limits of muscle power. We examined the speed and anatomy of the Dracula ant, Mystrium camillae, who use a snap-jaw mechanism to quickly slide their mandibles across each other similar to a finger snap. Using high-speed video, we found that mandible snaps occur in as little as 23 μsec and reach speeds of 90 m/s, making them the fastest known animal appendage. We also discovered that snap-jaw mandible shape is specialized for bending, consistent with their use as a flexible spring. These results extend our understanding of animal speed and demonstrate how small changes in shape can result in dramatic differences in performance. Video showing 3D surface models of snap-jaw ant and biting ant mandible, head, and muscle anatomy.